Survivable Remote Site Telephony (SRST) – It is a call processing backup mechanism that allows Cisco IP phones to register to a Cisco router locally during a WAN Failure. Let’s say you are connected to your Headquarter Site A remotely via Site B using WAN. In case, the WAN links goes down, IP Phones at site B should register to the local Site B router to avoid any outages. In this case, you VoIP calls inter-clusters will not work as the WAN link is down but however calls made to the local site will work as the phones will be registered to the local router. 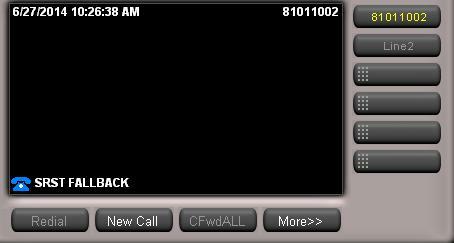 As the Phone will register to the local site, the mode is called as SRST Fallback Mode. Let’s do the basic configuration. Step 2> Adding the SRST Reference in the Device Pool of the Site B Phones. To Enable SRST on the Site B Router, you need to configure the below. Note:- The above configuration will only make your IP Phone fall into SRST mode. To make/receive PSTN calls, you need to configure all relevant configuration like E1/T1, dial-peers, DSPs/Transcoders etc. During a WAN Failure, your Phone will fallback into SRST mode as shown below. *Mar 1 01:09:37.091: %IPPHONE-6-REGISTER_NEW: ephone-1:SEP00255649DF28 IP:10.1.1.3 Socket:2 DeviceType:Phone has registered. I think you should publish an articule about SIP SRST and its requeriments on ISR platforms.